VANCOUVER — As nearly 18,000 red-clad believers lather themselves into a frenzy ahead of ‘O Canada’ on Wednesday afternoon, Team Canada goaltender Mikey DiPietro’s heart will be beating so hard you might be able to see it under his sweater. His trick to surviving? Breathe. It sounds overly simplistic, but his strategy to cope in the cauldron of pressure is not unlike the methods used in mindfulness apps on your phone – with help from Canada’s mental performance consultant, Dr. Ryan Hamilton. His teammates should try whatever DiPietro is doing. Because while everyone else’s wheels were falling off on New Year’s Eve, admittedly letting the moment get the best of them, DiPietro was Team Canada’s rock in the crease. 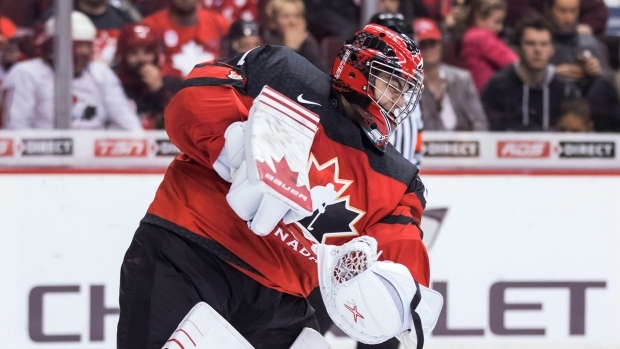 DiPietro entered the World Junior Championship as one of Canada’s question marks, but he now has the opportunity to be the calming influence Canada so desperately needs on home soil when they face Finland in a do-or-die quarterfinal at 6:30 p.m. ET on TSN 1/3/4/5 and 4K. Captain Maxime Comtois lost his cool against Russia, taking two penalties as he has a penchant for doing, but DiPietro remained cool and collected. The Canucks’ third-round pick, playing on his potential future home ice, has allowed just three goals against in his three starts in the tournament. He has masked an underwhelming Canadian defence without looking rattled. As DiPietro said that, there was a twinkle in his eye, a grin on his face. Not everyone enjoys pressure, but he seems to invite it. He isn’t overconfident and definitely not cocky. He just exudes the personality of someone who is self-assured of his preparation and comfortable in his own skin. That rubs off on the rest of the locker room, even if nothing is said. If DiPietro seems like he is ahead of his teammates in that department, well, he is one of the few who has legitimate big-game experience. He went 4-0-0 with a .932 save percentage as he helped the Windsor Spitfires to the 2017 Memorial Cup in his hometown. He was awarded the Hap Emms Memorial Trophy as the tournament’s top netminder. That was two seasons ago. DiPietro has literally been groomed for this moment. Team Canada made him the team’s third goaltender behind Curtis McElhinney and Darcy Kuemper at last year’s World Championship. On a 25-man roster with Connor McDavid and Jordan Eberle, DiPietro was the only one not on an NHL roster. He didn’t see game action but was along for the ride to learn the ropes, with Hockey Canada knowing he would be counted on here in Vancouver. That experience in Denmark pales in comparison to what DiPietro is seeing here. “Especially when games are must-wins and the games are so tight, the smallest difference, the smallest inch can be the biggest difference in the game,” DiPietro said. “Especially with the tournament being in Canada, there’s added pressure, I think, not only what everyone puts on us, but the pressure we put on ourselves,” DiPietro said. The pressure Canada is facing is history. No Canadian team has ever failed to medal on home soil. This is the 13th time Canada has hosted since 1978. The truth is, Wednesday’s quarterfinal is the hump Canada has to get over. Win and they are guaranteed to play for a medal. They will have also passed the pressure test. If Finland says the pressure is on Team Canada, then DiPietro is ready to shoulder the load. He alone may be enough to get them through.